Time for the Trendwatch 2016 Report. 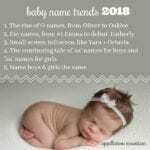 If you’ve been following Appellation Mountain over the years, you might recall that I like to watch specific baby names every year. Some of them I choose specifically for the Trendwatch Reports, but often they’ve been on my mind for months. My Trendwatch 2016 Report for boys comes in at a respectable 4 hits and 5 rises for a score of 6.5/15. Points were awarded as follows: one full point for every hit, plus one half point for every rising name. I think I’ve scored this inconsistently over the years, but I’ll stick with this system going forward! Wilder – I watched Wilder for a while. The name combines a rugged, outdoorsy feel with a preppy, buttoned-down vibe plus it has that stylish -er ending. Wilder made my preppy hellraisers list, and I can see the name appealing to different families for many different reasons. Cairo – A place name with an o ending? This seemed like a lock to make the US Top 1000 last year, and it did! Denver – Another place name and an -er ending name, plus a name featuring the letter ‘v’ in the middle? Denver entered the US Top 1000 in 2015 after more than a dozen years’ absence. Achilles – Ancient Achilles has a cool, interesting sound. With Atticus and Atlas rising rapidly, Achilles seemed like a logical possibility for parents. Sure enough, the name debuted in the US Top 1000 for the first time last year. Fox – Fox seems like a name that should be catching on. It combines the sound of names like Max and Jax, plus the nature/word name appeal of River and Chase. 193 boys were named Fox in 2015, up from 164 the year before. I think it’s worth continuing to keep an eye on Fox. Harris – The success of Harrison suggests that Harris could be next. Sure enough, 202 boys were given the name in 2015, up from 176 the year before. I’m confident that we’ll see Harris in the US Top 1000 in another year or two. It’s just too good a name to overlook! Shepherd – Gentle Shepherd rose in use, with 173 boys receiving the name last year. Plus, I hear this name discussed on baby name forums with some frequency. I think it will tip over into the Top 1000 in another year or two. One hurdle? The equally valid spelling Shepard is rising in use, too, up to 115 boys in 2015. That means that combined, the name already ranks in the US Top 1000. Dashiell – Just Dash appears in the US Top 1000, but somehow Dashiell has yet to break into the rankings. The name climbed in 2015, with 173 boys receiving the name. I’m keeping this one on Trendwatch 2017. Koa – Koa jumped in use in 2015, from 111 newborns to 161. A legit name imported from Hawaii, it combines all the appeal of Kai, plus the sounds of long-time favorite Noah. Like Dashiell, this name remains on the Trendwatch list for 2017. Harlem – It might make a great place name, but this one basically held steady. Creed – This feels like a go-to modern virtue name, but it fell slightly in use. Noble – My thinking for Noble mirrored the reasons Creed made the list – but Noble also fell! Bear – A brother to Fox, Bear was given to 134 boys last year, up three from 131 the prior year. I call that flat, so it goes in the miss column! Decker – An -r ending, a cool, edgy sound and … Decker still failed to catch on. Linus – Maybe it’s just me, but Linus strikes me as a logical substitute for boy names like Benjamin and Oliver that have been so very popular. So far, Linus remains under the radar. If my Trendwatch 2016 Report for boys resulted in a respectable performance, my girls report is … not quite up to that standard! Only 1 of my 15 predictions was a hit! An additional 8 names rose, for a total score of 5/15. Yikes! Ophelia – My one and only hit for the Trendwatch 2016 Report was Ophelia. Combine the rapid rise of Olivia and our affection for all things ending in -lia, and Ophelia seemed like a shoo-in. Plus, the equally Shakespearean Cordelia recently cracked the Top 1000. Sure enough, on this one, my crystal ball worked. 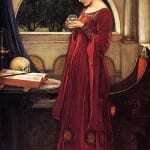 Marlowe – With names like Harper and Margot so in favor, how can Marlowe fail to succeed? As with Shepherd, spelling counts might present a challenge. Marlowe rose, up to 220 newborns from 205 the year before. But Marlow was up, too, and Marlo – which offers more of a retro vibe – remains in use. Mavis – Mavis remains just a tick outside of the US Top 1000. It missed the list by five births, and about a dozen official spots. But I think the momentum remains in favor of Mavis’ eventual return. Ramona – 242 girls were named Ramona in 2015, up from 236 the year before. Is that enough to consider Ramona rising? Maybe not, but the trendline seems clear on this name anyhow, so I’m calling it a rising name. Lottie – Lottie gained, from 67 births to 78 births. But here’s the thing about Trendwatch: if my goal is to find names likely to crack the US Top 1000, Lottie never belonged on the initial list. It is very, very rare for a name to skyrocket in use, from less than 100 to more than 250 births. I’ll bear this in mind when making next year’s list. Poppy – Poppy sounds like another name for grandpa to many Americans, and so it’s never enjoyed the same popularity here as elsewhere in the English-speaking world. 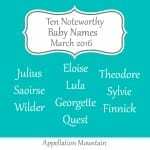 Thanks to a few high profile birth announcements and our ongoing affection for all names floral, that’s starting to change. Seraphina – Long and lovely, Seraphina should appeal to the same parents who have embraced Alexandra and Isabella over the decades – and it seems like that’s starting to happen. Eisley – A modern surname name, vowel heavy, with musical ties? Eisley seemed destined to succeed. And it did rise, from 187 births to 194. 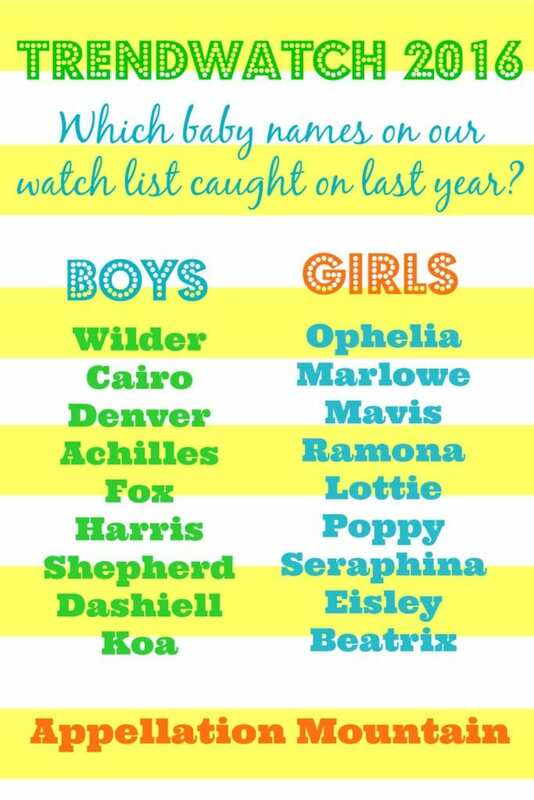 But I’m wondering if Eisley just gets lost in all the similar-sounding names? Beatrix – I remain astonished that Beatrix fails to crack the current US Top 1000. It gained in use last year, up to 209 births from 179. Could 2017 be Beatrix’s year? Sylvie – The darling of baby name forums everywhere, the winner of March Madness 2016, and … a name that fell in use last year, down to 212 from 228. While Sylvie earned me no points in this year’s Trendwatch, I’m tempted to keep it on the list for 2017 anyhow. Persephone – I expected Persephone to follow Penelope up the charts, but instead, it fell in use by about two dozen births. Delia – Delia could succeed on sound alone, but so far, it’s not happening. Betty – Sassy, retro Betty also fell in use. Emerald – A word name, a color name, and a gemstone, too, Emerald fits right in with Sage and Scarlett and Ruby. Except Emerald fell slightly in use last year. Annabeth – Annabeth makes for an appealing alternative to Annabelle, a less traditional pick than Elizabeth, with ties to Percy Jackson, too. And yet, Annabeth fell in use last year. Stay tuned for next week’s Trendwatch 2017 Predictions, where I’ll pick the names I expect to rise in the coming year! Ooh Everest needs to go on next weeks list!